..Pace of Bering Sea changes startle scientists… – A Nibble – A Bite – or a Meal! 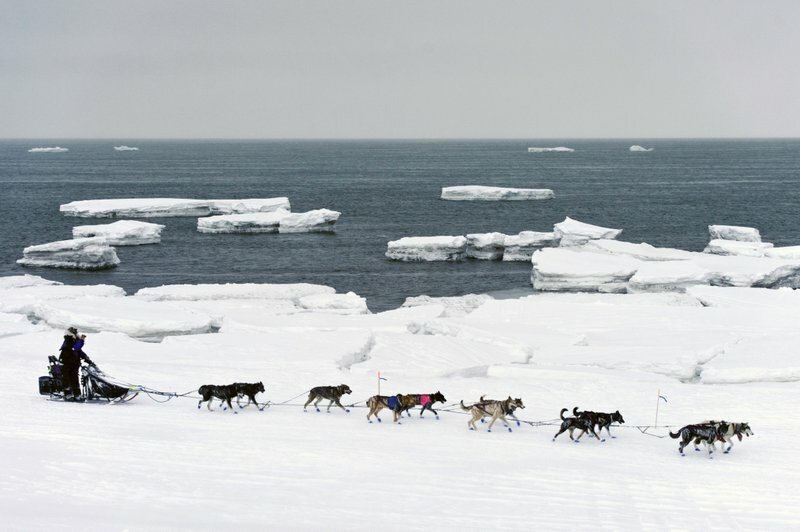 Jessie Royer passes icebergs in open water on Norton Sound on March 13, 2019 as she approaches Nome, Alaska, in the Iditarod trail sled dog race. When a Feb. 22 storm pounded Norton Sound, water surged up the Yukon River and into Kotlik, flooding low-lying homes. The Bering Sea last winter saw record-low sea ice. Climate models predicted less ice, but not this soon, said Seth Danielson, a physical oceanographer at the University of Alaska Fairbanks. Frigid north winds blow down from the Arctic Ocean, freeze saltwater and push sea ice south. The ice normally prevents waves from forming and locks onto beaches, walling off villages. But not this year. In February, southwest winds brought warm air and turned thin sea ice into “snow cone ice” that melted or blew off. When a storm pounded Norton Sound, water on Feb. 12 surged up the Yukon River and into Kotlik, flooding low-lying homes. Lifelong resident Philomena Keyes, 37, awoke to knee-deep water outside her house. Rapid, profound changes tied to high atmospheric temperatures, a direct result of climate change, may be reordering the region’s physical makeup. Ocean researchers are asking themselves if they’re witnessing the transformation of an ecosystem. Walruses and seals use sea ice to rest and give birth. Villagers use sea ice to hunt them. Sea ice is the primary habitat of polar bears. Sea ice also affects commercially valuable fish. Sea ice historically has created a Bering Sea “cold pool,” an east-west barrier of extremely cold, salty water at the bottom of the wide, shallow continental shelf. The wall of cold water historically has concentrated Pacific cod and walleye pollock in the southeastern Bering Sea. “It tends to extend from the Russian side to the northwest,” said Lyle Britt, a fisheries biologist for the National Oceanic and Atmospheric Administration. Researchers found high concentrations of Pacific cod and walleye pollock in the northern Bering Sea. But the species that was supposed to be there, Arctic cod, was hardly found. More than half the fish landed in U.S. waters come from the North Pacific, and most are caught in the Bering Sea. Chad See, executive director of the Freezer Longline Coalition, a trade association of vessels that target Pacific cod using baited lines, said members caught their quota last year but had to travel farther north. “Does that mean that the stock is declining, is suffering because of the warming temperatures? Or is it that they’ve moved north and it’s still a vibrant fishery?” See said. It’s too soon to conclude that atmosphere and ocean changes are due simply to climate change, said NOAA physical oceanographer Phyllis Stabeno, who has studied the Bering Sea for more than 30 years. The southern Bering Sea since 2000 has undergone multi-year stanzas of low and extensive ice, she said. When sea ice in November began forming as usual, she expected a bounce-back this winter. Instead, warm winds in February mostly cleared the northern Bering Sea of sea ice through the Bering Strait into the Chukchi Sea. Previous Post …Feeling the heat donny boy?….